Ukroboronservis has signed a contract with Grand Power s.r.o. The state-owned company Ukroboronservis, incorporated into Ukraine's defence concern Ukroboronprom, and Slovak Grand Power s.r.o. have signed an agreement on the joint manufacturing of pistols in Ukraine. The agreement was signed within the framework of the Arms and Security international exhibition currently held in Kyiv, Ukroboronprom said on its website. The two companies will join forces to develop new modifications, exchange experience and technology. "Because Slovakia is a member of NATO and the EU, this will allow us to direct joint efforts at creating new samples of state-of-the-art firearms in line with NATO's standards and take Ukraine's mutually beneficial cooperation and partnership with Western partners to a new level," the statement reads. 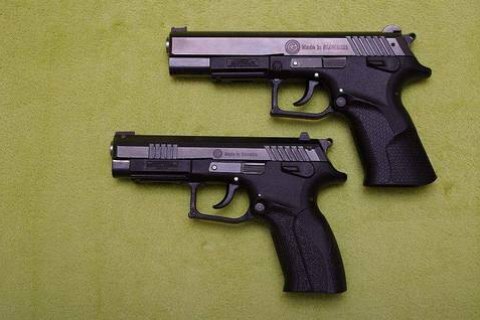 According to UNIAN, Ukraine will assemble K100 semi-automatic pistols and K105 subcompact machine guns. According to Ukroboronservis, in the future these firearms may be supplied to the Ukrainian Armed Forces, National Guard and Interior Ministry.